"There are relatively strong associations between built environment and Body Mass Index, even in population-dense New York City," said Andrew Rundle, Dr.P.H., lead study author and assistant professor of epidemiology at the Mailman School of Public Health at Columbia University Medical Center. The study appears in the March/April issue of the American Journal of Health Promotion. Researchers looked at data from 13,102 adults from New York City’s five boroughs. The authors discovered that three characteristics of the city environment – living in areas with mixed residential and commercial uses, living near bus and subway stops and living in population-dense areas – were inversely associated with BMI levels. For example, city dwellers living in areas evenly balanced between residences and commercial use had significantly lower BMIs compared to New Yorkers who lived in mostly residential or commercial areas. "A mixture of commercial and residential land uses puts commercial facilities that you need for everyday living within walking distance," Rundle said. "You’re not going to get off the couch to walk to the corner store if there’s no corner store to walk to." So, a rolling stone doesn’t gather moss? How do you keep your study’s numbers from being skewed by all the models? BMIs are not extremely accurate. Anyone who does any amount of even light, healthy weight training has a skewed BMI. For example, my BMI puts me in the Obese range. But the study’s point is taken, and if you are using BMIs as a barometer for all groups I guess it all averages out. Or maybe it doesn’t even out… It could understate the weight difference if all of walkers are bulking up by carrying sacks of groceries 3 or 4 blocks and up a few flights of stairs. Yup. In other words, New York City folks are probably in even better shape then their rivals in the study. I find it funny that when I visit folks outside of NYC and see them struggling and agonizing when bringing bags of groceries in to the house from the nearby car and then realize that many of us in NYC are lugging those same grocery bags 5 or 10 blocks home wihtout a respite! The article doesn’t say…. did they control for income? Seems to me that good transit and a healthily zoned neighbourhood results in higher demand and wealthier residents, who are less likely to be obese (is my understanding). But Clarence, I do have to point out that you do not live that close to a train… and your closest stores are pizza shops. Aside from the controversy over the accuracy of BMI, the concept of a person who walks more being healthier than a person who drives more, absolutely makes sense to this girl who spent 9 years getting fat driving around Los Angeles only to move to NYC and lose it all in 6 months of walking around Manhattan! BMI breaks when you look at any particular case, but it’s valid for statistical purposes; you’d expect the big-but-muscular people to counter out the gimpy-but-fat folks. What about the case we were discussing where New Yorkers are both losing fat by walking and gaining muscle by carrying their groceries? It’s nice that someone thinks I am sculpted. I have to walk 8-10 blocks (usually) with my groceries. And I love pizza, thus my higher-than-it-would-look BMI. 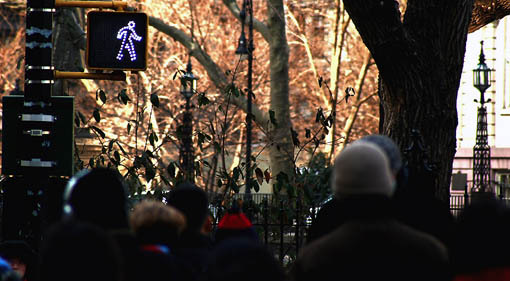 Pedestrian fatalities in NYC are disproportionately concentrated on streets in high-poverty neighborhoods, according to a new Department of Health analysis.